In a couple of weeks Nintendo will finally open up its eShop, ushering in a new era of old games remade for the 3DS. In this calm before the storm, 99Bullets is the only sound we hear. 99Bullets is the best and brightest of this week's Nintendo Download, an easy task considering the competition. 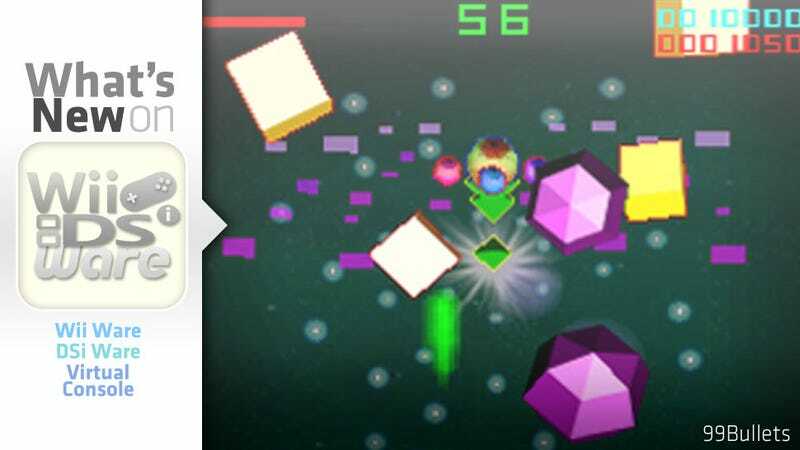 We've got a DSiWare rehash of Puzzle Quest: Challenge of the Warlords, a game I've already played on several systems (including the DS); 3D Twist & Match, a game that transforms everyday objects into Rubix-style twist puzzles; and Overflow, a fluid-based puzzle game for WiiWare. With three of this week's four offerings puzzle titles scrolling shooter 99Bullets should be a breath of fresh air. Players have 99 bullets to make it through each of the game's more than ten levels. The better you conserve your ammo the higher your score. Two more weeks to go before things get really interesting. Let's all take a really long nap! Description: Puzzle Quest: Challenge of the Warlords delivers classic puzzle action combined with an epic story of good versus evil. Enter the world of Etheria, a land that is quickly becoming swamped with evil. Help protect the kingdom of Bartonia from the undead invasion and seek out the source of these vile creatures to ensure the safety of your countrymen. Challenge your skills in single-player campaign mode or battle your friends via wireless multiplayer (broadband Internet access required). Match gems and unleash devastating spells to defeat your opponents. Complete more than 150 quests in the expansive and immersive story mode. Description: Professor Lexis just finished his greatest and most energy-efficient machine yet. However, the moment he flipped the switch for the first official test, the machine exploded and sprayed all of the professor's new multicolored fuel everywhere. He now needs your help to collect the precious fuel and repair the damage before the worldwide energy symposium begins. Twist your Wii Remote controller to place wooden planks, funnels and particle transportation portals to guide the fluids back to the correct collection channels and repair the damage in 30 warped levels. The professor will even have you tackling the dangerous task of mixing fluids to create new fuel colors. Just be sure to contain the spill before you cause an overflow.